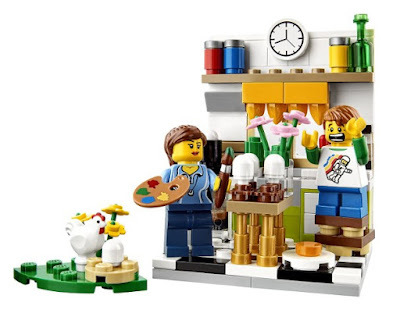 The scene, which is built upon an 8 x 8 studded base (like many of these little diorama sets) depicts what we assume to be a mother and son decorating eggs at Easter time. But - oh dear - the young chap has gone and dropped one, resulting in a dollop of raw egg on his mum's kitchen floor. And there's also a separate bit with a chicken on it. For some reason. The whole thing took about 20 minutes to put together. The mum and the son are great minifigs, but our attention is totally snagged by the boy's shirt. How awesome is that? He uses the child leg piece to make him shorter, and thanks to the relative height of his mum's hair part, this effect works quite well. Their alternate faces seem to have them swapping emotions, but it's great to get something very different for each character. The weird little chicken section is just a green curved plate, a flower, an egg (in a nest, we assume) and a chicken. It doesn't really work alongside the domestic scene in the kitchen, unless the family have their own hen and this is supposed to be outside of the kitchen window. Either way, dunno. But the real meat of the set is the kitchen. This is great, casting out minds back to the level of clever detail seen in the Kwik-E-Mart set. You build the cooker, hob, sink, drawers, coffee machine, table with eggs, stool for the boy, and a shelf with a few items perched upon it. And look at that floor! With the table removed you can better see the detail of the back wall and counter. On the hob there is a pan in which an egg is happily boiling away, the oven opens to reveal a tray of cookies, and both drawers can slide open. The ultra tiny coffee machine is great, as are the curtain parts (which are actually Mixel teeth pieces). Above the window is a one stud-wide shelf with some jars and a transparent green bottle, as well as a clock. There's also good detail on the reverse of the wall, with textured brick parts used very well and a glimpse of the action taking place within. With the table and boy back in place you can see the eggs next to flowers in a vase. The boy gets his own little stool, presumably so he can reach the eggs, but it also serves to increase the distance between him and the smashed egg on the floor. Surprising what you can achieve with a white disk part and a smaller yellow one on top. Mum gets a paint mixing palette and a brush (although two were included in our set - maybe a mistake, but nice to have another one for the boy to be posed up with). The few studs on the floor make is possible to put the figures, as well as the table, stool, and smashed egg, in a number of different positions to customise the scene however you want. "Calm down, kid. Have a cookie." 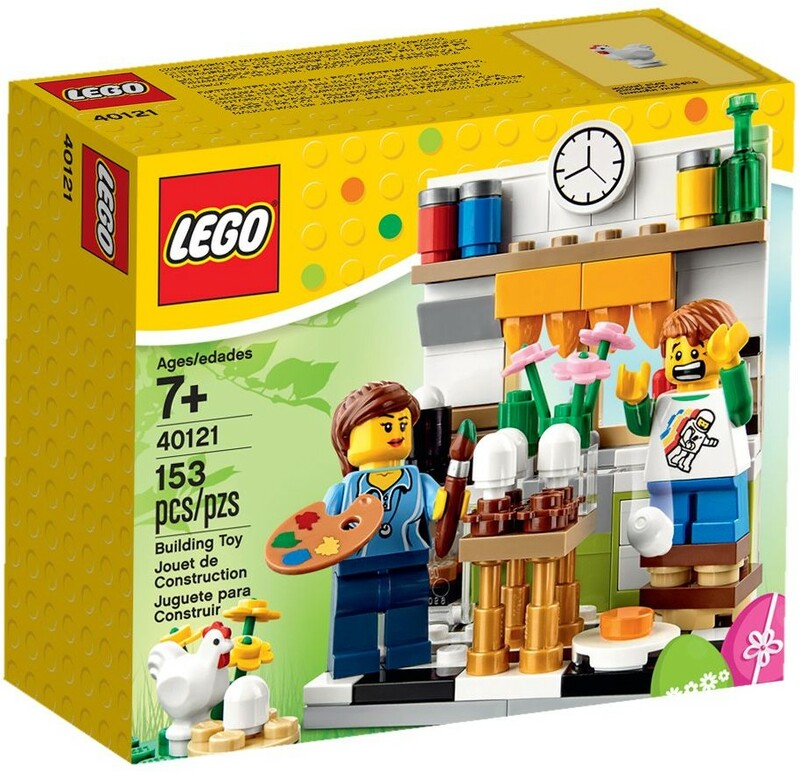 LEGO Painting Easter Eggs #40121 is a great little set that would be a perfect present regardless of the time of year. The sub-£10 price means you get quite a lot of value, as sets such as this always contain small interesting parts normally found only in larger, more expensive LEGO products. A great display scene, but also a fun play set in its own right.